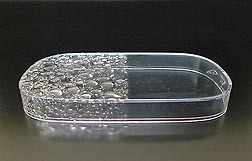 A nanoparticle-based coating from ARS, applied to the right half of this plastic container, prevents water from beading and reducing visibility. When rain falls on a glass window or a plastic skylight cover, it often forms beads. That’s because these surfaces typically are hydrophobic, meaning they repel water. But a transparent, nanoparticle-based coating developed by Agricultural Research Service scientists can quickly change surfaces from hydrophobic to hydrophilic, so that rain doesn’t bead up, and your visibility isn’t impaired. When raindrops come in contact with the spray-on coating, they spread, instead of beading, explains chemist Sanghoon Kim, who headed the nanoparticle studies. Besides its potential use on windows, the coating might also be applied to solar panels, to help keep dirt from interfering with their performance. What’s more, Kim and colleagues have observed that the coating works well on other materials, including Plexiglas and metals such as stainless steel. Kim, chemist Atanu Biswas, and physical scientist Kervin Evans—all at the ARS National Center for Agricultural Utilization Research in Peoria, Illinois—created the coating’s nanoparticles using only a few off-the-shelf laboratory chemicals, including an ag-sourced protein. From start to finish, production of the nanoparticles takes less than an hour, involves simple procedures with inexpensive chemicals, and doesn’t require specialized equipment or costly heating. Simply stated, the nanoparticles were formed when ethyl cyanoacrylate reacted with bovine serum albumin in a solution of acidified ethanol. Spinning this mixture in a centrifuge removed any byproducts of the reaction, resulting in nanoparticles suspended in the solution. Applying the coating is quick and easy. All that’s needed is to spray it onto clean glass or other recommended surface, then rinse with water. Kim, Biswas, and Evans documented their results in a peer-reviewed scientific article published in 2013 in Colloids and Surfaces B: Biointerfaces. In a followup study, Kim and colleague Yeon Seok Kim, of the National Institute of Standards and Technology, used gliadin—a protein from wheat—to demonstrate that their process is applicable to both plant- and animal-derived proteins. An article published this year in the Journal of Nanoparticle Research has details. Typically, plant proteins are less expensive than those from animal sources. Regardless of which agricultural source is chosen, informal cost estimates suggest that the new coating could be made at the same or less cost than hydrophilic coatings already on the market. The fact that the Peoria coating is rain-ready in about a minute apparently makes it unique. ARS is seeking a patent for the research, and the scientists are looking for industry partners, such as manufacturers of window-cleaning products, to commercialize the invention.—By Marcia Wood, Agricultural Research Service Information Staff. Sanghoon Kim, Atanu Biswas, and Kervin O. Evans are with the USDA-ARS National Center for Agricultural Utilization Research, 1815 N. University St., Peoria, IL 61604; (309) 681-6260 [Kim], (309) 681-6406 [Biswas], (309) 681-6436 [Evans]. "Transparent Coating for Glass, Plastics—and More—May Have Bright Future" was published in the May/June 2014 issue of Agricultural Research magazine.